While looking for a new pontoon boat, you need to make sure that you get the most bang for your boating buck. Since most of the people think pontoon boats is a stodgy, slow putt around the lake. But now this thinking is changing very fast. Forget everything that you know about pontoon boats from growing up with folding beach chairs and twin logs topped. Today most of the boats offer speed, seaworthiness, handling, comfortable seating, luxurious amenities and also the ability to use a legit tow boat for wakeboarding and skiing. Although they don’t sacrifice passenger comfort, amenities as well as their strength, they have never been more cushy or diverse. If you are watching for the latest and greatest pontoon boats on the water, there is good news for you. We have made a list of 10 (in no particular order) best pontoon boats to please your passion. Have a look at the reviews and check out these pontoon boats with their pros and cons. Colorado is one of the best-rated inflatable pontoon boats on the market. It is a classic accessory Colorado XT pontoon boat with transport wheel and motor mount. Most of the fishing enthusiasts called it “top of the life” pontoon. It’s packed with nifty features will make your fishing experience as enjoyable as possible. It is 9 feet long and has 400 pounds carrying capacity. It comes with a transport wheel which can be removed and replaced into the storage compartments for a more comfortable launch. 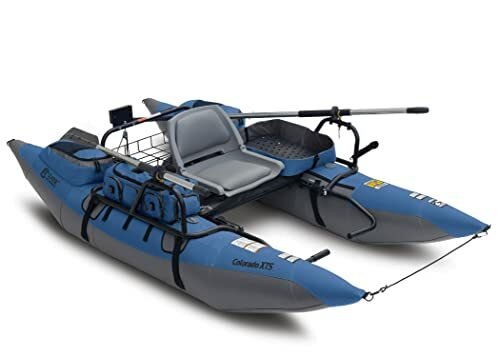 It also features waterproof motor unit, two removable gear bags with 20 pockets, a wire basket for rear storage or battery, two insulated cup holders, a multi-position rod holder, two detachable foam fly patches and much more. The bottom of the boat is coated with abrasion resistance heavy-duty PVC that prevents getting punctures to avoid a longer problem if you accidentally brushed against rocky surfaces. The top of the pontoons is made of tough nylon. The bladders are made of cold and heat resistant vinyl which is not going to shrink or expand depending on the weather. It takes two minutes to fill with air through a small electric pump. Colorado XT has everything that a fisher would want. Its storage capabilities do not let you worry about bringing all the gear with you. You will be most likely to have storage left even after all the gear packed. Its smart anchor system allows you to stay in the favorite spot without drifting away while fishing. This pontoon is loaded with enough features to make your boating experience awesome. Not recommended for saltwater use. The Colorado XTS is the newer and upgraded version of the Colorado XT. It is more streamlined and more additional featured pontoon that boosts comfort on the water. Classic Accessories are upgrading the materials for Colorado XTS. This 9 feet long Colorado pontoon boat has a bundle of angler-friendly features. It comes with a durable and non-corroding brass oar lock which makes it able to perform optimally for a longer time. It features a handy swivel seat that allows the users to position themselves most effectively and comfortably for fishing or relaxing on the lake. The padded seat can be swivel for added mobility and fold down to transport and storage. It features a stowable transport wheel which simply stored in the framework for the ultimate convenience. It comes with huge storage capacity, includes 20 pockets with plenty of room for all the gears and two insulated drink holders. It has two large removable side pockets combine to create a portable gear bag. It also provides two detachable micro-slit fly patches to keep flies handy when the fish are rising and the stripping basket for side or lap mounting. Pontoon bottoms are covered with abrasion resistant PVC, and the top is made of nylon. Rod holder can be placed in six positions to suits your needs. Its heavy-duty cold and water resistant bladders have quick inflation valves and bladder zippers to prevent snagging. Colorado XTS is a simple, easy to operate, cost effective and quick to assemble light recreational fishing pontoon. Removable side pockets that can create a portable gear bag. No middle position motor mount. 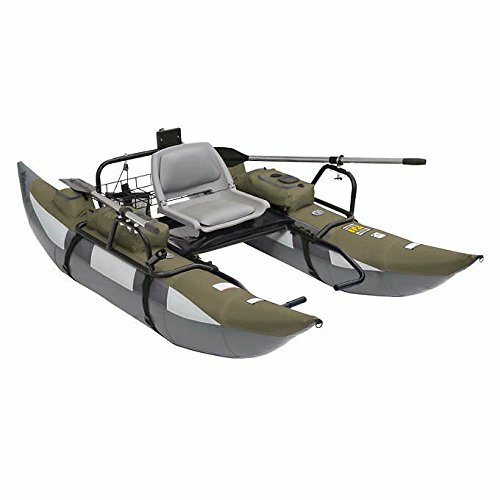 Sea Eagle FoldCat is a stable, well-built inflatable pontoon boat which is ideal for fishing. This is a unique patented folding frame boat which is lightweight and portable. You can conveniently store it in a closet or a small space. Sea Eagle Green fishing boat does a great job of allowing the boat to blend in with natural surroundings. 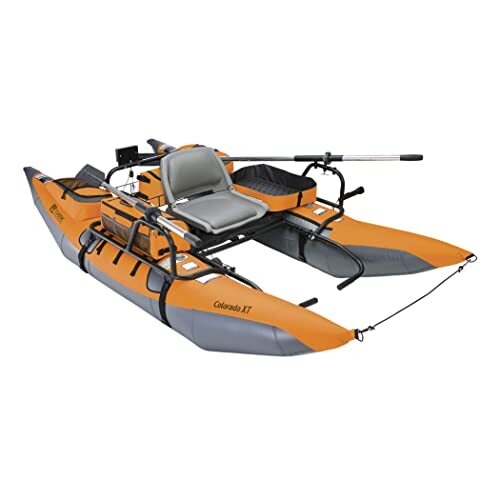 FoldCat fishing boat measures 148″ X 54″, which provides plenty of space for two people. The boat weighs 75 pounds and can support maximum 650 pounds. It has two floors. First, the super light aluminum cross boards give the floor excellent strength and stability. A reinforced broad base supports it and able to handle unevenly distributed weight without tipping. It also allows the boat to the place where other never be able to reach. And the second floor is a full fabric floor that runs the entire length of the boat. It comes with two comfortable swivel seat. The padded 360-degree swivel seats are perfect for fishing. This floor support electric batteries tackle boxes and lures and more. Its highly customizable design also added variety accessories like- motor, canopy. It also features a Scotty Rod mount system, oarlocks and oars, four convenient carry handles. This boat lasts a long time and easy to set up. As it takes less time to get the boat in the water, it gives you more time for fishing. Cones may start leaking after several uses. The outcast fish cat pontoon is a fun and reliable fishing boat. If you like to fish on rivers, then this tough, as well as versatile boat, will never disappoint you. It is also very stable to catch fish on rivers that are rough and rapids. This boat is not just for the adrenaline seekers but also for a relaxing fishing trip, adventure and for inaccessible places that you won’t be able to reach with a big drift boat. It can easily navigate through streams, lakes, inlets, slack water, rivers and high reeds. It is 13′ long and 5.5 “wide. This boat is made of durable, lightweight aluminum slat roll up over full fabric floor. It also consists of 20” vinyl air cells covered in flexible 1000/1000 PVC fabric that makes them highly puncture resistant. With the additional one-way Summit II valves, accidental deflation is now becoming a thing of past. This outcast boat has 750 pounds load capacity while it’s construction weighing only 170 pounds. This 11 piece frame boat makes sure that you can spend more time on the river or fishing as it is easy to set up and pack up. It can easily fit in the back of any moderately sized truck. Though this Fish Cat pontoon boat is built for two anglers, it can easily be converted into single seater by removing the front platform. This boat is designed to fit a mount for an outboard motor and two 8 foot oars. It’s integrated anchor system is also a nice touch including mount, motor, air pump, anchor and rope. It allows a vast range of optional extras to add with it. You can also get yourself rod holders and casting platform for more versatility. It comes with seat saddle bags, extra cargo carriers and seat caddies. Due to lightweight, it does not track as well as heavier boats. Though kayak fishing is excellent fun, you may feel a bit insecure on a kayak. In this case, it becomes easy to navigate a river or lake with this portable and inflatable pontoon boat. This Colorado Inflatable boat which comes with a motor mount is built to American Boat and Yacht Council standards. This boat designed with a pair of inflatable 9′, abrasion-resistant PVC pontoons which attach to a powder coated steel tube frame. 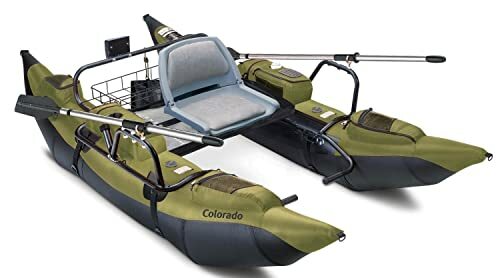 Colorado inflatable boat is engineered to follow fish through the shallowest waters of lakes, bay, and rivers whether you are motoring or padding. 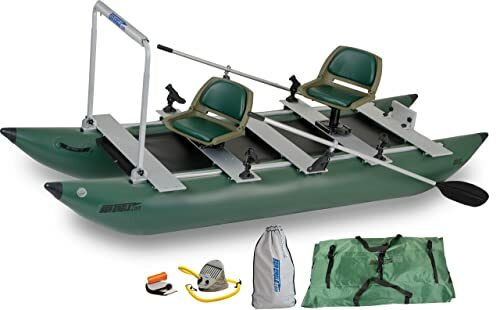 It features set of 7′ aluminum oars, 20 storage pocket, two insulated drink holder, a dual side stripping apron, a detachable fly patch, double hull pontoon bladders, an integrated anchor system, a six position rod holder, a padded plastic seat and non-slip footrest. Its maximum weight capacity is 400 pounds. No other boat is faster than its class. This boat performs a complete performance which will let you enjoy your water sport. It is amongst the best boats regarding money to quality ratio. Majority users are satisfied with the overall quality and also can be backed by a two-year warranty. This boat is also pretty easy to set up. Maximum anchor weight capacity 6-8 pounds. 7 feet oars are made of aluminum. Avid anglers feel a little bit awkward at first. The Roanoke pontoon from classic accessories features a steel row frame integrated with two 8 foot long pontoons. The row frame can be broke down into several pieces which are held by cotter pins. Its powder coated steel tube frame protects from rust and corrosion. The oars are sturdy and appropriately sized to the boat. The seat and lock positions on this boat are fixed in one place. The higher part and lower part of this boat are made by nylon and abrasion resistant PVC respectively. The PVC part is limited to the bottom third of the pontoon tube. It comes with two zippered storage bags suitable for tackle boxes, lunch and water bottles are placed on the pontoons. Roanoke does not offer much features and accessories. It does not come with an anchor, motor mount, padded seat, cup holders and rod holders. As it is fewer bolt-on accessories so, it’s a lighter boat and also easy to set up. Though it lacks several features, this simple pontoon is suitable for anglers who don’t want a lot of bells and whistles. Cold and heat resistant bladders. No anchor and motor mount. Sea Eagle’s Frameless boats are lightweight, roomy and ultra-portable which are the right choice for anyone who wants to get away to the water to enjoy some quality time. This pontoon boat is a perfect fishing platform for all flat water conditions. It is great for lakes, bays and rivers. This frameless boat requires less space and ideal for beginners, intermediate level and experienced fisherman who wants to avoid stress, the inconvenience of rigid hulls. It can be paddled, rowed and powered by small gas or electric motor. You can take it anywhere you want. The unique shape of this boat permits the maximum use of total fishing space with minimum weight. Its floor constructed of 1000 Denier polyester coated fabric raises the user nearly up off the water. This inflatable pontoon boat is not only the fastest and easiest assemble fishing boat but also durable and robust to prevent any punctures. Fully equipped with swivel seats and motors. Sits have no way to tie down. FoldCat inflatable fishing boat is a groundbreaking innovation of Sea Eagle. This extraordinary fishing boat is quite best for two people with a max weight of 650 lbs. Its hull is based on a true catamaran design which contains two independent hulls held together by a solid frame. Sea Eagle FoldCat patented folding frame features five aluminum roll up slats over a full fabric floor. The two hulls and fabric floor around the slats form a convenient size which is rigid enough and easy to carry. Its compact inflatable design offers three advantages –stability, absolute rigidity and fabric under floor. This design provides an incredible surface balance with twin hulls. The fabric floor prevents anything from falling through the slats into the water below. The other thing that you like about it is the seat. It has green, comfortable swivel chairs with cushioned seat and back that provide complete 360-degree coverage. This fishing boat uses tough 1100 Decitex reinforced material for the hull and a quadruple overlap seam. It is a top end product which avoids becoming damage. No one can complain about the quality of it. It can be leaked where the factory glued the pontoon to the cone. 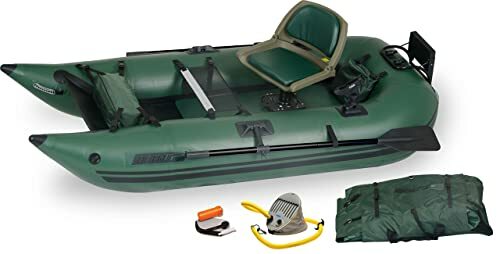 The wilderness SE inflatable pontoon boat provides room for all of your gears. This boat offers a removable transport wheel that is convenient to get you into the water faster. It features six mesh and six zipped pockets. 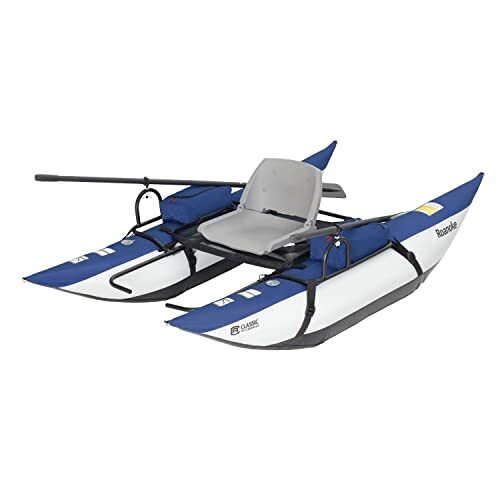 Besides its oars and padded swivel, it provides transport wheel, footrest, motor mount for trolling and includes everything that you need to go out to the lake in comfort. It is 57 inches long, and 28.5 inches wide with 80lb weight and can hold up to 400lbs and is best suitable for class 1 river use. People over the world always find a way to enjoy their holiday with various outdoor sports. Fishing over float boats is one of the top choices among all. 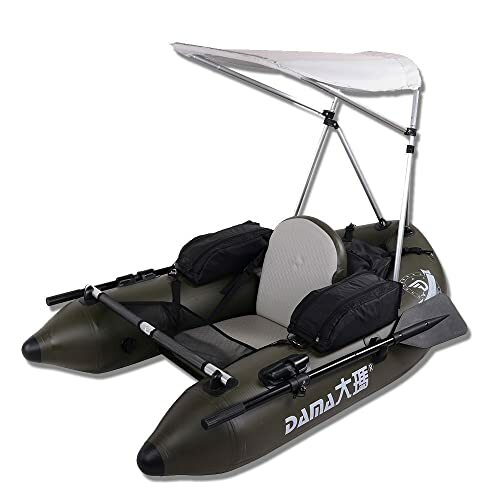 DAMA fishing inflatable pontoon tube boat offers you a new way to enjoy fishing in the summer. It is the most suitable product for you that assures quality very well. These heavy-duty pontoons with abrasion-resistant PVC bottoms and rugged nylon tops provide a quality experience to you. This boat with 380 lbs weight capacity is detachable and portable. 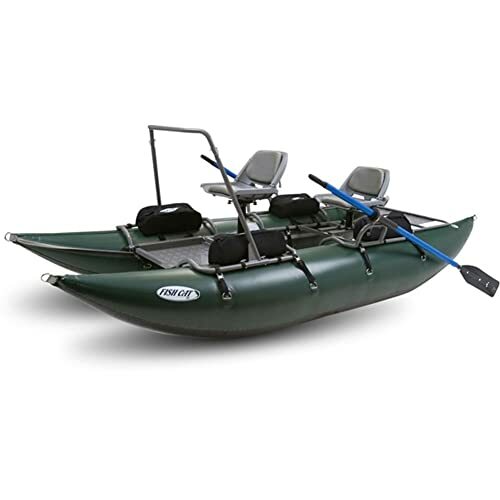 This boat features a comfortable padded seat, adjustable backrest and two fishing rod holders. It provides an anchor system with fill able mesh bag and hydrodynamic hull for superior tracking and steering. It’s cleat and pulley controls can fit on both left or right side of the boat. It offers one year warranty for you. It comes with a handbag. It comes with a manual air pump. In recent years manufacturers continually up huge developments on pontoon boats to make the rides more incredible than ever. There is a wide variety of pontoon boats out on the market today. The pontoon boat which is perfect for you depends on the properties for what you are purchasing and how you intend to use a pontoon. Due to a wide range of amenities, there is no doubt that pontoon is a favorite vessel for a variety of uses. Using this kind of watercraft can be an amazing way of relaxation indeed.